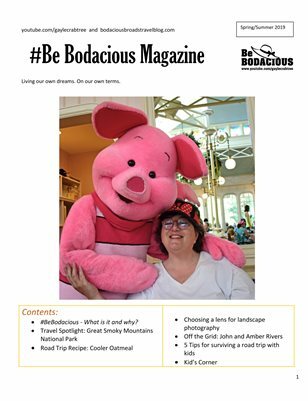 #Be Bodacious Magazine is about having fun in life not matter what comes our way. Each 12 page issue has a travel highlight, tips, camping recipes, featured contributors and more. Articles are often inspired by the Bodacious Broads Travel Blog and the Gayle Crabtree YouTube channel.